I started this project in 2010. 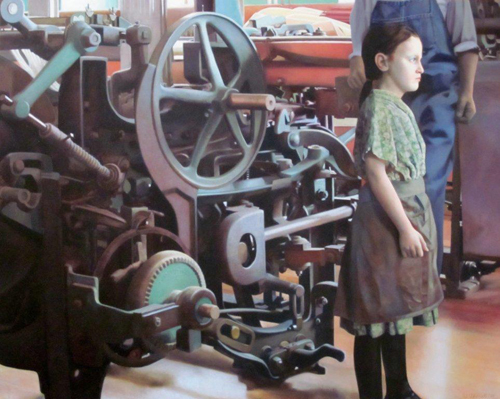 This is the story of Child Workers in the Eclipse Mill in North Adams, MA – the same Mill where my Gallery is located. 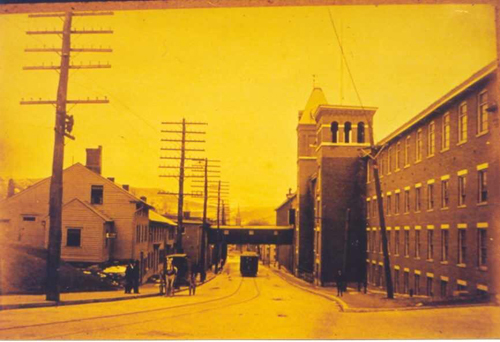 The Eclipse Mill was built in the late 1800s and was one of the major cotton mills in the Northern Berkshires. The Eclipse Mill was sited along the Hoosac River to take advantage of the river for power and as a dumping ground for wastes. My Gallery – Studio 109 has taken over the space that was the Boiler Room. I was among the original group of 40 artists that bought in to the renovated 125,000 square foot Eclipse Mill in 2005. Over the past couple of years locals have finally come in to the Mill to explore its offerings and see its transformation. Some of these individuals have shared with us their personal connections to the Eclipse Mill, which often meant that their parents or grandparents worked here. Another group of visitors – cultural tourists from Montreal or New York City wanted to know what this Mill was before the present Artists Condominium Lofts. So, I put together a team of Painters, an Historian, a Musician, a Filmmaker and Educators who helped tell this specific story: WHAT WAS IT LIKE TO BE A CHILD WORKER IN THE ECLIPSE COTTON MILL in 1911? We did about a year’s worth of research which included interviewing some of the families who had direct connections to the Eclipse Mill, we visited mill museums including the Lowell National Historical Park, we learned about Mill Children from Joe Manning’s years of research, we read National Child Labor Commission Reports, Strike Reports, etc. Our starting point was August 1911 when social reformer Lewis Wickes Hine took 9 photographs of the Child Mill Workers in front of the Eclipse Mill in North Adams, MA. 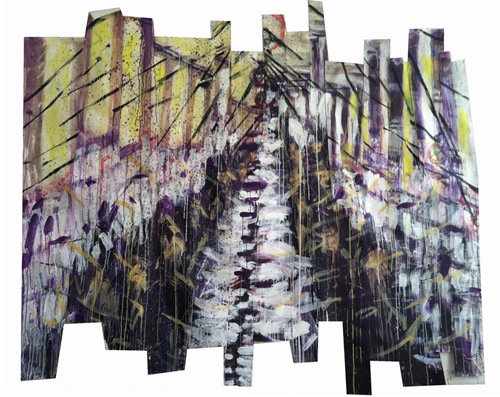 Realist Painter William Oberst and Abstract Painter Dawn Nelson reinterpreted Hine’s Photographs in their personal styles and Composer/Musician Matt Hopkins created original music that talks to the moods inside this Mill 100 years ago. Child Workers in front of the Eclipse Mill in 1911. Photograph by Lewis Hine. From the mid 1800’s to the early 1900’s as American society was morphing from a rural agriculturally based one to a more industrial urban one, it was the poor parents and their children that were among the mix of workers in most of the large mills. Many of the workers in North Adams during this period came from the farms in French Canada. Children as young as 6 years old were a part of the mix in this country’s Woolen Mills, Cotton Mills, Canneries, Tabacco Plants, Coal Mines, Glass Works, etc. 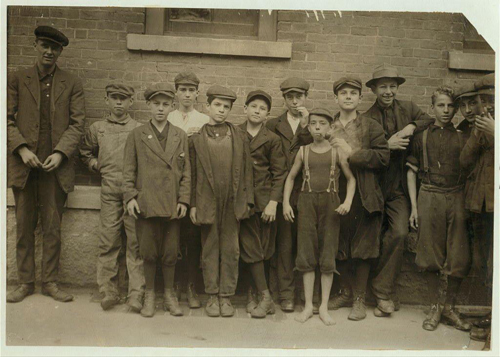 The Child Workers in front of the Eclipse Mill in 1911 were a part of the 2 million under 16 years of age children that were a part of the American work force – many working at least 12 hours a day in rough conditions with lots of injuries and lack of schooling. Most had to work to keep their families from starving. Records show that a typical family got paid about $30 a week: $12 for the father, $9 for the mother, $5 for the girls and $4 for the boys. WHO WAS LEWIS WICKES HINE? 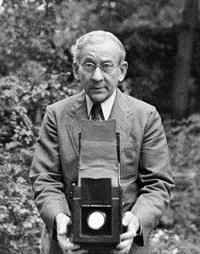 Lewis Hine was born in 1874 in Wisconsin. In 1901 he moved to New York City and accepted a position at the Ethical Culture School where he began to use a camera as an education tool. In 1906 he did freelance work for the National Child Labor Committee. Hine was on his way to become a Sociological Photographer and took on assignments to photograph the crowded tenements in New York City and record the differences between the unskilled immigrant workers in Pittsburgh, PA and the comfortable middle class of managers and politicians. In 1908 the NCL Committee retained Hine to photograph child labor practices in the various mills, factories, canneries, etc. around the country. In order to get inside the mills he told the managers that he worked for their insurance companies and, because he was trained as a teacher, he was able to get significant details from the children about their ages and working conditions. The funds dried up around 1917, but it was Hine’s photographs together with the photographs of Jacob Riis and the actions of Mother Jones that helped change the public’s attitudes about Child Workers and thus the enactment of stricter child labor laws which brought the minimum mill working age from 12 to 14. In 1917 Hine’s salary was reduced by the NCL Committee sufficiently that he had to stop traveling to the mills and instead worked for the American Red Cross, Ellis Island and in 1930 was hired to photograph the construction of the Empire State Building. © Dawn Nelson. All Rights Reserved. In 1931 a major exhibition of Hine’s photographs took place at the Yonkers Art Museum just north of New York City and in 1932 his book Men At Work was published. Even though Hine was appointed head photographer for the National Research Project of the Works Progress Administration in 1936, serious cutbacks in corporate and government work caused him to lose his home and in a cruel irony, he was forced to survive on welfare like some of his subjects had to do. Hine died in 1940 at the age of 66. His son Corydon donated his prints and negatives to the Photo League which then offered them to the George Eastman House in Rochester, NY after the Museum of Modern Art declined any interest. Today, thousands of Hine’s photographs can be found in the collections of the Library of Congress, the George Eastman House and the University of Maryland. Fast forward to 2011: In March the photography auction at the Swann Galleries in New York City brought in $20,000+ each for some of Hine’s photographs. Also, on American farms it is still legal to allow 12 year old workers where severe injuries are common. The Department of Labor has issued new child labor rules meant to prevent these accidents. This White House has yet to act! Our plans are for THE MILL CHILDREN Exhibition to travel to other Mill Towns in New England and beyond over the next three years. Also, our lead Educator Anne French has prepared a Teacher’s Guide to this Exhibition so as to engage the students and their families in the history of their Mills and Child Labor practices. 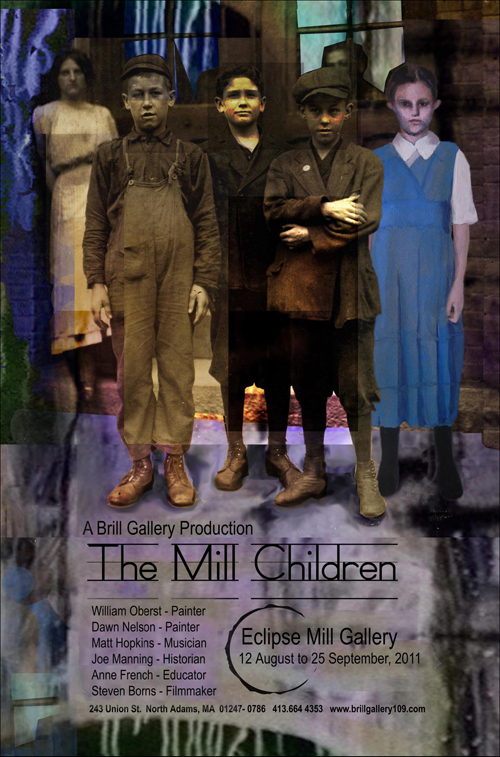 Click here to read the online iBerkshires article, "Child Labor, History Exposed in Brill Gallery's 'Mill Children'"
I would like to extend a tremendous appreciation to all those who curated and participated, in any capacity, in the Mill Children Exhbit. i think this one of the most haunting and important shows of local art I've ever seen because it revived and exposed part of the soul of the building. . . not to mention, it symbolized the tone and culture of the region in that epoch. As a staunch advocate of public education, I feel for those children, as I know you do also. when my grandmother was 13, she was pulled out of public school in Brooklyn by the principal, who offered to get her a sewing job making overcoats for the war. It paid, almost 80 cents per coat, which was amazing money in those days, for adult or child. My grandmother had the requisite skills, and she was licking her financial chops, as were here parents. She took the job and never reentered any kind of formal schooling again. she was happy. . . blissed out in her ignorance. I am still researching the motivations, culturally, as to why she was directed this way by her school. Was she that poor a student? misbehaved? or just too visually incongruent for the anglican establishment at that time? who knows? It was not until many years later that she wrote a wonderful letter (subject not worth discussing here) to me and apologized for her phonetically spelled english. She spoke well; she wrote poorly, though with vigor. She was very bright, but simply not encouraged in a better direction. I see in this sensitive exhibit a grotesque exploitation of youth. . . the show appropriately and importantly demonstrated this. It was part journalism. I was moved, angered, pensive, and reminded about the inextricable link between past, present, and future. And at the same time, I was also reminded about the resiliance of the human spirit. . . . I am sure these children had some triumphs, joys, many tragedies, amibtions, jealousies. . . just about everything was challenged for them. I am sure their futures were far grimmer and even shorter than the children of the proprietor class in north adams and nearby towns. yet they moved in a path, however fraught with society's evils, because they proved once again that the human spirit was alive and well and always worth fighting for. I was humbly given the opportunity to reflect upon their sacrifices and how they are juxtaposed with our youth today. Thank you for empowering me, making me think, and motivating me to remain proactive . . . . WHAT a show ! ! !